July 19, 2014 – Protesters cradling sheets wrapped to look like dead children rallied in Oakland on Friday to call on the United States to withdraw financial support for Israel over that country‘‍s military assault in the Gaza Strip. The group of about 100 protesters waved signs and Palestinian flags, and chanted slogans such as, “Make a choice, Obama, human rights or apartheid!” in front of the University of Pittsburgh’‍s Hillman Library on Forbes Avenue as evening traffic rushed by, with some cars honking in support. 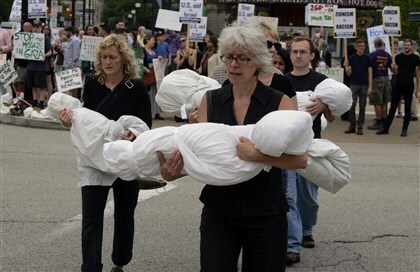 Holding the sheet-wrapped figures — one of which included what looked like the dangling legs and shoes of a young girl — the group then marched along Forbes and Fifth avenues to draw attention to their cause.